The ancient Roman poet Virgil wrote, “The greatest wealth is health.” Americans seem to be somewhat obsessed by health, and the vibrancy of the global supplements market shows that people all over the world are focused on health as well. The global nutrition and supplements market was worth $96 billion in 2012. In 2013, it was approximately $104 billion globally. The greed of these major retailers seems to have clouded their judgement and placed the lives of their millions of customers in potential harm. As if it weren’t already confusing enough to stand in the vitamin aisle and try to choose the right supplement, now it seems as if you can’t even trust that the labels you are reading are telling you the truth. In a recent case of deceptive and false food labeling, the New York attorney general issued a cease and desist order to Wal-Mart, Target, GNC & Walgreens after tests of 24 of their supplements were shown to contain fillers and all but five of the products contained DNA that was either unrecognizable of from a plant that was other than what the label claimed. Some of the supplements contained wheat and beans which are known to cause allergic reactions in some people according to a story in the Washington Post. At the Washington, D.C. law firm of Paulson & Nace, PLLC, we are here to fight for our clients’ rights and defend them from the deceptive business practices of unscrupulous merchants. We hold deceptive and negligent merchandiser and manufacturers accountable for their actions. If you were misled by a false label on a supplement, our consumer protection attorney wants to help. Under the Dietary Supplement Health and Education Act (DSHEA), supplement manufacturers are responsible for making sure that the products they sell are safe, and that any claims they make about their product are substantiated by adequate evidence. FDA supplements do not need FDA approval before they can be marketed. According to DSHEA, the FDA must be able to prove that a product is “unsafe” before it can take any action to remove it from the marketplace. False representation of a product and deceptive labeling violates the FTC Act and state consumer protection statutes. If you have discovered a dietary supplement is more or less than the manufacturer claims it to be, a consumer protection attorney at Paulson & Nace can advise you about your options for pursuing legal action against the supplement manufacturer. Deceptive and illegal practices have put dietary supplement users are great personal risk. 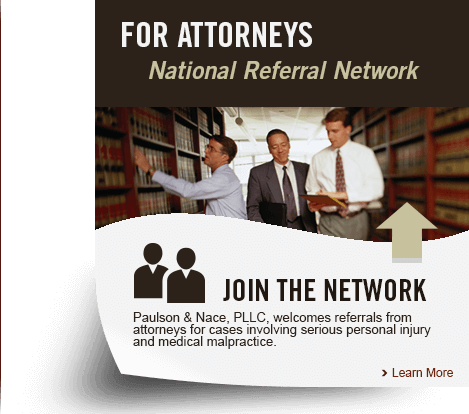 Paulson & Nace, PLLC has the skill and the resources to help those who were harmed because of false advertising. To schedule a consultation with a Washington, D.C. consumer protection lawyer, please call 202-930-0292 or fill out our contact form.